Help Send a Veteran on Their Honor Flight! Honor Flight Arizona gratefully accepts donations of any amount to continue our mission of taking our WWII and Korean War Veterans to see their memorials in Washington D.C. at NO cost to the veteran. We operate under 501(c)(3) tax-deductible rules for non-profits and have no paid staff. It costs our organization $1,150 to take a Veteran to Washington, D.C. 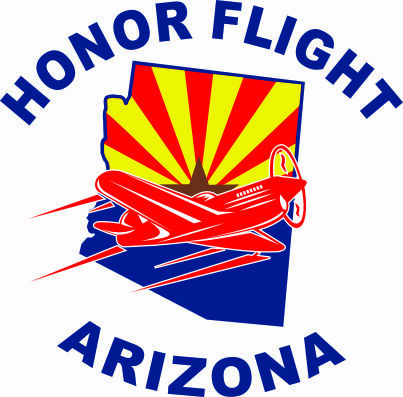 Honor Flight Arizona receives NO government assistance. We are supported ONLY by individual, community, and corporate donations. Need help deciding on a donation amount? Trips are simply not possible without public support. Prior to Honor Flight Network, many veterans had given up hope of ever seeing their memorials. Now they have hope –- but time is of the essence. Visit our PayPal Giving Fund page to make a donation (PayPal covers all processing fees). PayPal Giving Fund does not provide a specific instructions section for donations in memory of, on behalf of an organization, etc. Please email Honor Flight Arizona with your instructions after making the PayPal monetary donation, if so desired. If your recurring donation is in honor of a special Veteran, on behalf of an organization or both, please enter the information in the “Add special instructions to the seller” section. To make a recurring donation, click the checkbox below the donation amount. You can change or cancel a recurring donation anytime in your PayPal account settings. The amount you enter will be paid each month from your PayPal account. If you don’t have PayPal, you can sign up easily while entering your payment information. Have a PayPal account? Click on the “Donate with PayPal” button below the amount on the PayPal page. Any and all donation amounts are gratefully accepted! Civic, military, and community groups are also encouraged to sponsor groups of veterans in their region who are on our waiting list.